A most captivating character has recently taken up residence in the contemporary galleries at the Art Gallery of NSW, migrating to Sydney, we’re told, for a season of rest and recreation. Watch out, Guido Valdez is here and he’s dressed to party. But who is this new man about town? ‘Guido Valdez (Vendetta for Love) has the bearing of one “out to impress”. He leaves a trail of admirers in his wake, as he travels the world seeking new sensations and excitement. A “bon vivant”, he is the consummate chameleon, able to adopt and perform a cavalcade of evolving roles. ‘Part matador, “superhero wrestler” and Latin lover, he is “dressed” in his colourful art gallery best. 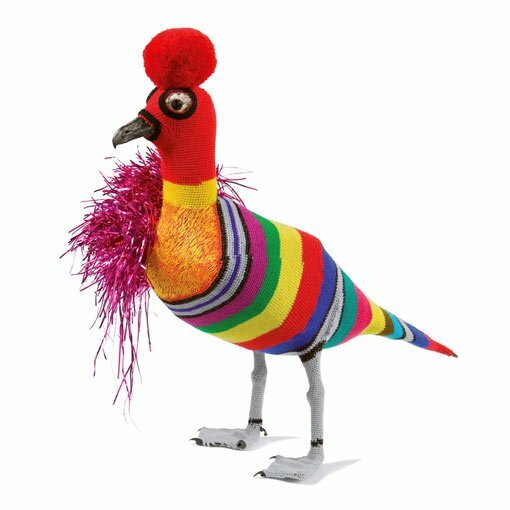 He wears his “plumage” with distinction; his chest aflame; the pom-pom rouge – a crest or award for services to avian wrestling perhaps? ‘He has muscle where it counts after all, and those wiry legs … well a dancer would be jealous. How must he feel; those tiny talons separated and enrobed in grey crocheted wool, a web, a net, a skin pulled tight to protect and offer comfort against the cold? Well thank you Louise, sounds like you know him rather well… Guido Valdez is in town for a few months, so let’s hope there’s time for the rest of us to get to know him a little better. *In 2006 Louise Weaver was invited to create a work and to design the cover of Art & Australia magazine (now ARTAND ). Guido Valdez (Vendetta for Love) is the outcome of that commission. He is on loan to the Gallery for the Colourwheel exhibition.